My name is Jessica, and I am 1/4th (or 1/8th if you count the cats) of the Boundless Bakers. I travel fulltime with my husband Ross, son Finnegan (4 years old), daughter Hazel (2), and yes, four cats. We have been living and traveling in our Crossroads Cruiser 5th wheel since November 2018. We launched from Heber City, UT where we worked and occasionally got the chance to live. We had a beautiful 2400 square foot home that Ross and I worked 90+ hours a week to live in. We had a fulltime nanny that spent more time with the kids then we did. Life was exactly as it was supposed to be. Right? Well, we finally got fed up enough with missing out on what truly matters in life and decided to change everything and hit the road! Living this fulltime RV lifestyle meant we’d be able to go from a two income family to one, get rid of the “things” that really weren’t bringing us joy, spend WAY more quality time together as a family, and see this beautiful country of ours! Even though Ross and I had been toying with the idea of fulltime travel for about a year, we didn’t pull any of the necessary triggers until August 2018, only three months before our intended departure date! First, we traded in my mom-mobile (aka Penny the Honda Pilot) for a 3500 Dodge Ram. This is when I knew things were really going to happen! We purchased our rig a few weeks later after only looking at a handful of options. I knew I wanted to renovate so we went with an older model, 2010 to be exact. What drew us to our tiny home on wheels was the mid-bunkhouse and how spacious 5th wheels feel with the higher ceiling. August through mid-November was spent renovating the RV and downsizing our belongings. We donated 99% of our things, sold a few more, and kept some items at our stick and bricks home for our renters. As for the renovation, our biggest projects were painting the entire interior white and redoing the floors. With Ross and I still both working fulltime, we knew our reno time was limited and wanted just to get the necessities taken care of. My biggest piece of advice for anyone renovating an RV is to take your time! Spending a little extra time properly sanding the walls or applying an extra layer of primer will make all the difference in the end. Because we had literally NO RV experience, we turned to the internet a lot through our transition and into the early days of fulltiming. Heck, I just watched a YouTube video yesterday on how to fix our broken antenna crank! A lot of our RV advice comes from YouTube. Some of our favorites include Keep Your Day Dream and Two Tired Teachers. Now that we are old RVing pros ;) we mostly look for advice on traveling, route planning, etc. We use Facebook groups such as Fulltime Families and Thousand Trails (Outdoor World) & Encore -- The Good AND The Bad, and apps such as Campendium. We are so happy to be living this lifestyle. We are honestly healthier and happier than we’ve ever been before. The amount of time we are able to spend together is priceless, and the experiences we are having are life-changing. I was worried about how this lifestyle would affect two toddlers, but I am happy to report they are thriving! They are more outgoing, adventurous, loving, and affectionate than they’ve ever been before. I have been so impressed by how well they’ve adapted to this change. So in closing, if you are considering changing your life and traveling full time, we hope we can inspire you, let you learn from our mistakes, and maybe even meet up with you someday on the open road. In the meantime, I dare you to live the life you’ve always wanted. Can’t wait for you to read Aaron & Mandy’s story! Their renovation is one of my top favorite motorhome renovations! They have two adorable kids and are rocking this full time travel gig! We're the Wilson's- Aaron, Mandy, Israel, and Elery. Aaron and I are originally from Indiana and then moved to Tampa, FL after we got married. Back in 2014, we decided to start traveling part-time. We were gone anywhere from 10 to 20 nights per month. We had a blast and the kids loved it too! Then we started to talk about buying a small travel trailer and using it to travel instead of hotels and the constant packing and unpacking. After shopping around, we decided just to go full-time and buy something bigger. We ended up with a Damon Challenger Class A motorhome and immediately took it home to start renovating it. Our goal with our renovation was to remove anything that "felt like a RV"! A few of the projects we have done: We turned a closet into bunk beds for the kids, painted everything white, built 2 couches, transformed our bathroom, and got all new bedding and decor. We sold all our stuff and rented our house back in September 2018 and love having less stuff! We are excited to start marking off things on our bucket list! How about a bit of an informal introduction for those who don’t know us. We are the McCloud’s, my husband Casey is our fearless leader, head bread winner and my favorite forever and always. Our daughters Taylan (9) and Chole (6) keep this unschooling mama on her toes. Colton and Mackie are our loyal road dawgs (see what I did there) and then there’s me. I am Raquel, the wordsmith behind https://www.instagram.com/mccloudlife/. I can’t say that I have a niche unless life is a niche. I love to write and share raw and authentic life and for us that includes a few big topics that fit within specific communities. One of those communities is nomadic tiny home dwellers, we sold our acre of land and 1,200 sq ft brick house to call our 38’ pull behind home. Unlike a majority of this community though we are attached to my husband’s job. As a union laborer (hopeful welder) we set up camp wherever they send us. Nearly 2 years in and we have called Ohio, Pennsylvania and Michigan home, as well as a campground in our hometown of Cookeville, TN. So, while tiny living is one aspect of our adventure it isn’t the only or our most important. I think my voice shouts loudest for choosing hope despite poor circumstances and adoption. I have a very unique perspective of adoption and before we talk about our current journey I want to share what got us here. For those unfamiliar with the adoption community we have a symbol called the adoption triad. It’s a triangle with each side representing a piece of that relationship- adoptee, adoptive family and birth family. A heart encompasses the triad representing the love woven throughout. Although adoption was not the chosen word it describes the relationship between my grandparents and I. My parents were a little self absorbed and struggled with addiction and as a result my pa and granny stepped in to raise me. After they gained custody at two years old my mother walked away, I’ve not seen her since. To make a long story shorter I will cut through the details to say my teenage years found me filling voids with alcohol, drugs and boys. My wild lifestyle came to an abrupt halt at 14 when a pregnancy test read positive. I share frequently about my adoption journey as a birthmother and how that decision was the hardest choice I’ve ever made. I share about our amazing relationship, her incredible parents and my own joys and struggles as I’ve navigated these somewhat uncharted waters. It’s the least talked about side of the triad, followed by the adoptees and then adoptive parents being the most celebrated. It’s a personal calling to both expose and celebrate this title, what led me here and be a voice of relatability for those who need it. So at this point that leaves one side of the triad and yes, I’ve experienced it as well. Adoptive mom. Our littlest blessing was adopted. Nothing about our life has been conventional and her adoption story is no different. We had physical responsibility of her by 4 weeks, legal custody by 4 months and finalized her adoption at 4 years old, just 3 months shy of her 5th birthday. This was all before selling our traditional home and packing our life, all of our belongings, 2 big humans, 2 tiny humans and 2 furry companions in a camper. This was before we ditched a stationary address, before we pulled away from the only town our kids have ever lived in and before we walked away from the “American dream” to pursue our own. I can say that adding to our family through adoption was not on our radar. Casey and I have struggled with infertility for nearly 9 years now and were making peace with our inability to grow our family. His career isn’t slowing down anytime soon and while many choose to travel for a set time this is our plan for the foreseeable future. How? When? Where? Why? Casey and I lost religion and found God early in our relationship so our faith has been an important factor for most of our married life. It’s what guided us into taking in our youngest. Had we stopped to count the cost, both mentally and financially we would have likely declined. My faith is what gives me a bold voice to share my story as a survivor of sexual abuse, verbal abuse, addiction, promiscuity and redemption. Our faith is what led us here. Casey took a winter layoff and we headed to our hometown to visit with friends and family that we hadn’t seen in months. Shortly after arriving I caught wind of the news. A friend I had spoke to years prior about opening an adoption center in town had finally seen her prayer materialize. I immediately secured a meeting with her to offer my story and my time. I was willing to speak on adoption, talk to birth mothers, hopeful adoptive moms, whatever I could do to help advocate for all sides of the adoption triad. I left that meeting feeling a tug. When I got home Casey and I discussed it and nearly instantly felt the same thing placed on our hearts … we were being called to adopt again. The next steps looked like they would have for any hopeful adoptive family with one exception. We had to stay stationary until our home study, finger prints and the other mountains of paperwork were complete. A ridiculous amount of paperwork, like an INSANE amount of paperwork ya’ll! I think we were most nervous about our home study though. We knew this would look different to our caseworker and was unsure how she would perceive this tiny space that we so lovingly call home. I think the most important part of this journey is transparency and honesty. We didn’t try to overcomplicate or paint an unrealistic picture of what our tiny home and lifestyle looks like. Our kids do share a small space. We don’t value an abundance of toys. We co sleep and cuddle, baby wear and cloth diaper. We do not believe we need a 2,000 sq foot house for a toddler to take his first steps in when we can give him a whole wide world of open expanses, soft grass and gritty sand. We don’t need space for a high chair, changing table, crib or swing. We live fully and love wholly within this space and that is all we need. Materialistically there is a checklist but it isn’t as strict as you might think. Our kids bunk room has 2 beds and a table that converts into a third bed. That third bed option was key. To pass a home study, at least in Tennessee every child needs to have their our bed, not bedroom thank God, just their own bed. We have that. We also have two kids that are happy and healthy and have flourished in this lifestyle for nearly two years now. At the end of the visit it was confirmed that we passed! P.s. If you would like to support our adoption we have a t-shirt fundraiser running through March and have set a crazy goal to sell 1000 shirts! The design was created by a sweet friend in response to our vision of what this new chapter of life means to us. We view life as a grand adventure and this is another chapter for our epic quest to live fully, intentionally, and embracing every simple moment. So excited to share J & Brit today from @TinCanRamblers. I started following them when they lived in a cute renovated Airstream & now they live in an RV they totally remodeled. Wait until you see how beautiful it is! Three years ago you could find my husband (J) and I (Brit) living in a 3 bedroom house in the suburbs of Nashville, TN. We loved our house at the time and honestly when we bought it we thought we would live there for decades but that plan changed. We started to feel stuck in the daily routine and wanted more adventure out of life. Our journey into this lifestyle started when I was obsessing over tiny houses and sending my husband absolutely everything I could find on tiny living. I was 110% sold on the idea and the thought of selling everything we owned sounded so freeing. I found so much inspiration from others who had already taken the leap and shared their stories through social media/blogs/youtube channels. I could just picture us rolling down the road with everything we owned in the home being pulled behind us! It took a while for me to convince my husband (he wasn’t sold on a tiny house) - but finally he came around and instead of building a tiny house he pitched the idea of an RV…..and the rest is history. Our main intentions in living tiny were to pay off debt, have financial freedom, and to be able to travel. We started downsizing immediately and sold/donated pretty much everything we owned - except a small amount of clothing. This process was so eye-opening, to go through the stuff we had been carrying around for years for no reason at all other than we thought we “needed” it. We put our house on the market, luckily it sold very quickly and we moved into an apartment while we renovated a 1980 Airstream Excella. We spent the winter completely gutting and rebuilding our new home on wheels, from flooring, to plumbing, to electrical, etc.. Luckily, we had family along the way to help us build our dream and we learned so much from the experience. We poured so much love into our little home and it was finally happening right before us. It definitely wasn’t easy though, we had challenges along the way and things would go wrong - at times it felt like we would never finish. Through this process we learned to not dwell on the problems - just fix them and move forward, it’s all part of the journey. What our life looks like currently...We’ve been mostly stationary in Nashville for the majority of the past 2 years, but we’ve been parked in southern Alabama for a couple months now and are looking forward to traveling more soon! If you are considering living stationary for any amount of time, a lot of rv parks offer a discount for monthly stays, and even seasonal rates if you plan to stay the entire season. J works remotely and my job is based out of Nashville. If you are looking for remote work, a great resource that we’ve found to be helpful is www.flexjobs.com. We also have two pups, Rocky is our 5 year old Yorkie/Pom mix and Charlie is our 2 year old Merle Long Haired Chihuahua. They have adjusted so well to RV life and we spend so much more time outdoors than we used to! We quickly fell in love with living tiny and don’t foresee stopping anytime soon! We stop and think about our purchases now and whether we actually need an item, because let’s be honest - we just don’t have room for non-essential items. One day when we are done with life on the road, we hope to build a small house in the mountains somewhere and maybe build a camper van for adventures. All this to say, if you are considering tiny living we encourage you to take the leap! It may seem scary at first, but the journey will be so rewarding! Happy Friday, i’m so excited to share Janelle from @homewiththehoopers. They’re enjoying full time travel and family time. “Hey babe, what do you think if I traded in my motorcycle for a camper?” asked Andrew as he returned from a trip to Sturgis with his father. I blankly stared at him holding our newborn son while my toddler used my legs as a jungle gym. I simply replied, “Okay.” Within two weeks, we were the proud owners of a fifth wheel toy hauler. We were so excited about the camping adventures and memories we would make with our kids. Never in my wildest dreams did I think we would ever be living in our “adventure house” full-time. Had anybody told me that is what was going to happen I most likely would have never been so carefree in my response to Andrew’s question that hot August afternoon 4 years ago. Two years ago, on March 10 this wild and crazy adventure we are on began. A phase is what we called it at that time; to last no longer than six months – one year. We had a plan. We were using our camper as a means to escape life in suburbia and transition to a life in the country. We weren’t happy with the mortgage we had, the car payments, the never-ending pile of stuff. It was all so suffocating. We dreamed of a simpler life, one that only the country could provide (so we thought). Financially we were stuck. We could not buy a piece of land as long as we had our mortgage. We are the Hoopers’. My name is Janelle. Together with my husband, Andrew, and our 2 little boys Corbin (5) and Wyatt (3) we sold our “picture perfect” suburbia home and comfortable life. We took everything we knew and felt comfortable with and left it behind. Downsizing from 3000 square feet to a little over 300 square feet, we moved into our tiny home on wheels in the pursuit of land (happiness). What we did not realize is how happiness would find us in those tiny walls. The debt disappeared. The stresses of life lifted. We never had to “pack” for vacations. We never looked for land. I will be the first to admit tiny living is not easy at first – it is a transition. Transitions can be painful. For me, I was a bit paralyzed if you will. 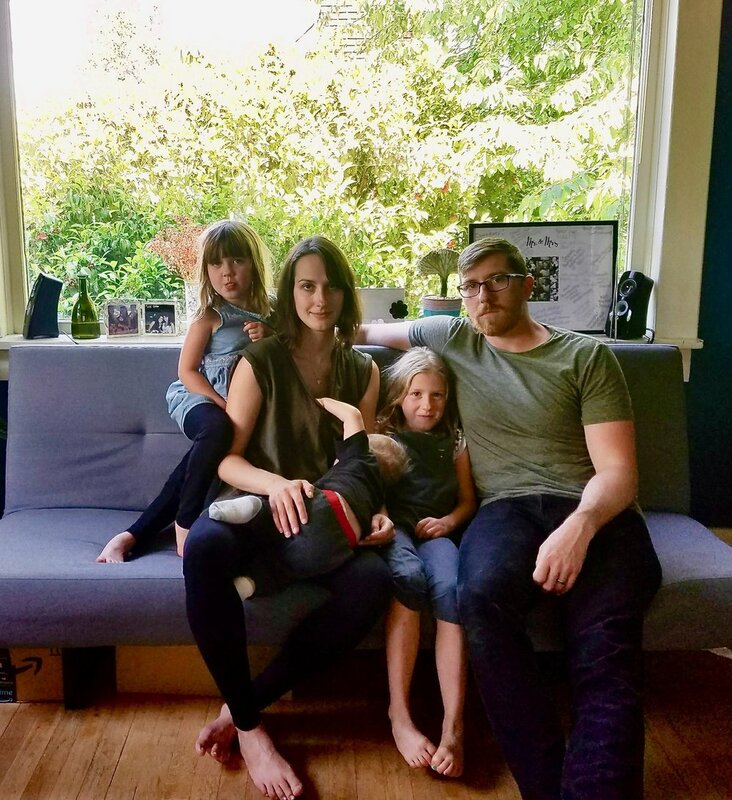 Within six weeks we had sold our house, sold a ton of our stuff, I tore down my baby’s nursery I had just completed – I was emotionally paralyzed which on the outside looked like survival mode. I was doing the bare minimum (ie: I am pretty sure we were eating cereal and PB&J for almost every meal). It literally hit me about one month into tiny living when Andrew so kindly reminded me that this was our home and it actually had to be cleaned like a house. I kid you not. I was in such survival mode and still coming to terms with the fact that I was now the dishwasher instead of my actual dishwasher HAHA! It literally never even occurred to me that our bathroom needed a cleaning or maybe I could dust. It was an awakening moment for me. I snapped out of whatever funk I was in and got down to tiny living business. I started organizing and downsizing more. I bought cleaning supplies and started talking about our new lifestyle with joy and hope. I tell you this story because tiny living is not for everybody. With all the tiny home shows on TV and Marie Kondo-ing going on these days it is very easy for one to feel as if their life is not good enough or they are selfish because they enjoy space and a large shoe closet. I hear you! I miss my bathtub and my walk-in pantry. I want to inspire you that you need to do you. YOU do what brings YOU joy. Think outside of the box, leave your comfort zone. Wanting to start your own bakery – do it. Want to write a book – grab a pen. Want to get a different degree - start applying to schools. The only thing that is binding you to your current life is you. You hold the power of change, don’t be scared to use it. Do not be scared to pursue that “stupid” idea you have been keeping to yourself for years – it may just end up being the greatest chapter of your life. Once we finally acknowledged that we were in fact tiny dwellers and this wasn’t as temporary as we thought we began to really embrace the lifestyle and all it has to offer. We became park hosts at a local state park and for 1.5 years our children grew up in a magical forest hiking and exploring every day. Their back yard was over 600 acres. It was a beautiful blessing for our family. Last year when Andrew was between jobs we took off and explored the west coast for 3 months. That was the trip that really made us step back and realize the wonders this lifestyle had to offer. We had been sitting on a gold mine of potential without even realizing it. We began to plan how we could in fact turn traveling full-time into a reality. A part of our souls came alive on that trip and we could not ignore it. When we got home, Andrew began searching for jobs where he could work remotely. He is in accounting and finance and was able to secure a job working from home and eventually the road! I quit my job as an RN right before Thanksgiving and we hit the road for full-time travel January 1, 2019. We are starting our fifth week of travel and I have never once doubted if this is what we are supposed to be doing. We have swam with manatees, kayaked, held baby alligators, and played in the ocean from sunrise until sunset. My kids have made friends from all over and talk about those friends often as well as their friends back “home.” They are thriving. We have asked them to let go of every sense of normalcy they had and move every week. We told them they wouldn’t be going to school anymore, but that mommy would be their teacher. They are thriving. We downsized their toys (again) and weeded thru clothes (again). They are thriving. Our oldest has come out of his shell and places his own order when we go out to eat, he goes up to new friends and starts the conversation, as much as he fights me on homeschool somedays (we are still learning a routine) he is learning SO much. Corbin is thriving. Our youngest little fellow walked into the ocean by himself and put his whole head under water, he is learning so much from big brother’s homeschool, his already bubbly and social personality has exploded. Wyatt is thriving. As for Andrew and I, we continue to grow together and learn more about each other daily. We can pretty much read each other’s minds when the other just needs a minute to be alone. We are perfectly imperfect. We are learning as we go and because of that we too are thriving. I am really leaning into the minimalist lifestyle. Almost two years in and I am still downsizing! Minimalism does not come easy for me, but its something I am striving for, not only for less clutter in our tiny space but for less clutter in my life. I have come a long way and as things I love need replacing, I am replacing with high quality items. If I have learned anything in this journey quality vs. quantity is key. If you are considering downsizing, I would take all the stuff you plan on bringing with you and take 1/3 of it. It is truly and simply amazing how little you NEED and the more you bring in initially the harder it is to let it go. So many people have inquired on how the boys do traveling (or are shocked with the amount of stuff we do with them). Our goal has always been to be inclusive with them. We want them to see and experience as much as they safely can at their age. Wyatt does not remember life without hiking and at the age of 3 he could easily hang with us on family hikes with fairly minimal holding. Our big secret, we are not above bribery. An ice cream treat is like the golden standard in our house and man is it a motivator. With that said, we are in a spell as I am writing this and there has been no ice cream treats all week. HAHA. When we are in places where we are outside 99% of the time the nighttime meltdowns tend to drastically increase due to pure exhaustion. On the same hand they have been outside playing in the dirt, fishing, climbing trees all day and just being kids so I am willing to deal with the tradeoff of meltdowns. On car travel days they generally do pretty darn great. The longest travel day we have ever done was 17 hours. That was once. Our typical long days are around 5 hours but most days average 2-3 hours. We are currently moving 1-2 times per week. On travel days I always pack lunches and snacks to have in the car with us. We do not have DVD players or ipads for them to use and that is our own personal choice. We have tried it and just do not like the vibe it brings into the car – again we are not above bribery and if we have a super long day ahead of us sometimes, we will download a movie for them. At the end of the day they are 5 and 3. Some travel days are better than others, but we power thru and roll with it. Children are incredibly adaptive and the benefits they are receiving from traveling are far too numerous to count. I do not think that children should be an excuse not to travel – they teach you so much in the process and to see the world from their eyes the first time they are experiencing new things is one of the greatest gifts. I’m so excited to share Kate from @thestreamlinedlife on the blog today! I started following her family because of their travels, but quickly fell in love with her motherhood podcasts! My hope is sharing all these amazing families will give you a push to not let go of your dreams & trust the process! It took us nearly 4 years to get the courage to hit the road full-time and after 8 months of living tiny, we only wish we had taken the leap sooner. In less than a year, we traveled ocean to ocean (driving more than 8,000 miles! ), took major leaps of faith, faced our fears, and became closer to our three kids than we could’ve ever imagined. It took saying just one yes to a different path than the typical American lifestyle to flourish and grow in ways we could’ve never dreamed of a year ago. Just one year ago we were drowning in old house repairs, busy and over scheduled days, and a lack of purpose. We knew we were capable as a family of creating a meaningful life together, but felt utterly stuck. My husband, Kirk, suggested we sell our house, pack up our belongings and hit the road; an idea I had had years ago, but decided would never happen. When we voice our dreams and give them the space to grow, big things happen. We followed through and hit the road in March 2018 with our then 6 year old daughter, our 4 year old daughter, and 10 month old son. We started in a 19 foot Scamp 5th wheel (just google it, they’re pretty tiny for a family of 5 and funny looking to boot) and later upgraded to a triple bunk 26’ Lance 2185 travel trailer. For once we had “just enough” and no visible clutter. The mental strain we had been under in our old life eased away, but it also made my anxieties more obvious. We had more time, open horizons to chase, and financial freedom. All of this potential was both absolutely freeing and totally overwhelming. You see, when we’re busy with the typical path, the home, the jobs, and all of the activities, it makes it easy to ignore what’s happening in our hearts. Full-time travel made it impossible to ignore the areas of our hearts that had gathered dust over time. My anxiety was always fear-related and spontaneous travel definitely triggered all of the “what if’s?” I learned to lean into the fear and accept it, such as the time we drove our truck and trailer on HWY 1 in California, with steep cliffs on my side and no guardrail or the countless times our GPS stopped working and we got lost. I let my children venture farther and farther from me in their outdoor play, trusting them as they also grew into their capable and wise selves. I trusted that God had led us to this path and that fear had caused me to play small my whole life. We wanted bigger for our family than the limitations we had always allowed to hold us in place. It was a fresh start in every possible way. Kirk and I had nightly talks, envisioning our path together and as a family. We fixed the ways we communicated as a couple and learned to listen better to one another. We took the time to hear our children’s hearts, their fears, and their dreams. Bit by bit, we all began to grow into more resilient and happier individuals. As I overcame my fears and leaned into motherhood, I envisioned a community of mamas doing the same. Women choosing a streamlined home and life, whether that’s on the road or in their stationary homes, and finding their value as mothers. I created a podcast called Streamlined Motherhood to share what the road had taught me, and I began working one on one with other women to create their own meaningful lives. Kirk began writing music again and playing shows while we traveled, finding and breathing life into his own calling. The road life became an endless well of creative inspiration for both of us. Our gamble, this lifestyle that others see as so different and alternative, paid off. We began marking our days in the experiences we had. 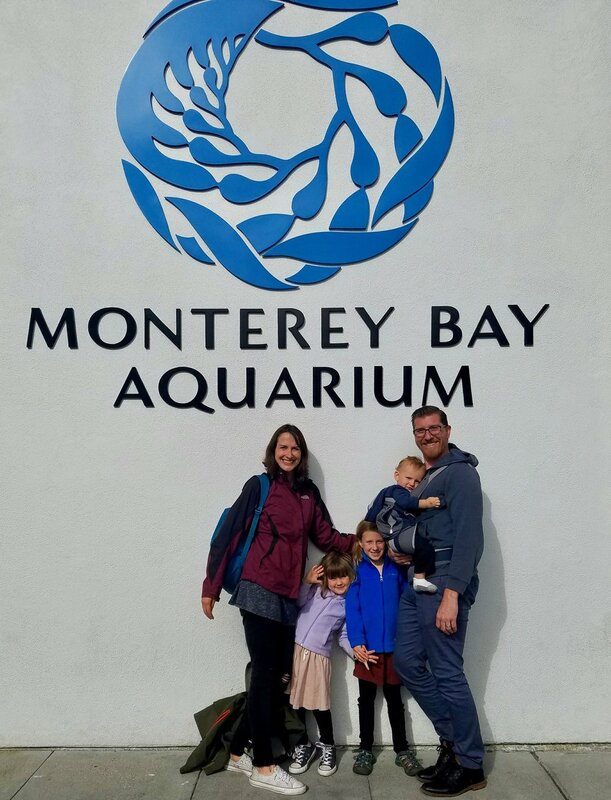 Our daughters learned to swim like fish in California, experienced their first waterpark slide in Nebraska, ate clam chowder in Rhode Island, and learned about pioneer life in Nevada. Our youngest learned to walk at an RV park in Northern California, and we celebrated his first birthday at the Pacific Ocean. Most importantly, we created a family culture around being brave, believing that your dreams matter, and that experiences are greater than things. Our children are not the same as that snowy day we left Indiana and neither are we. Road travel, for us, was always about more than living tiny and sightseeing in the United States or perfect Instagram shots. We love those parts of full-time travel life, but also craved the personal growth that we anticipated would come with this lifestyle. Road travel has been a way for us to grow into the family we saw ourselves as and become the type of people who are courageous, who take action, who love deeply, see education as a way of life, and who prioritize family and faith above all. It wasn’t easy to transition to this lifestyle, but we don’t ever see ourselves going back to the way we did life before. The road changed us for the better, and for that, we are so incredibly grateful. 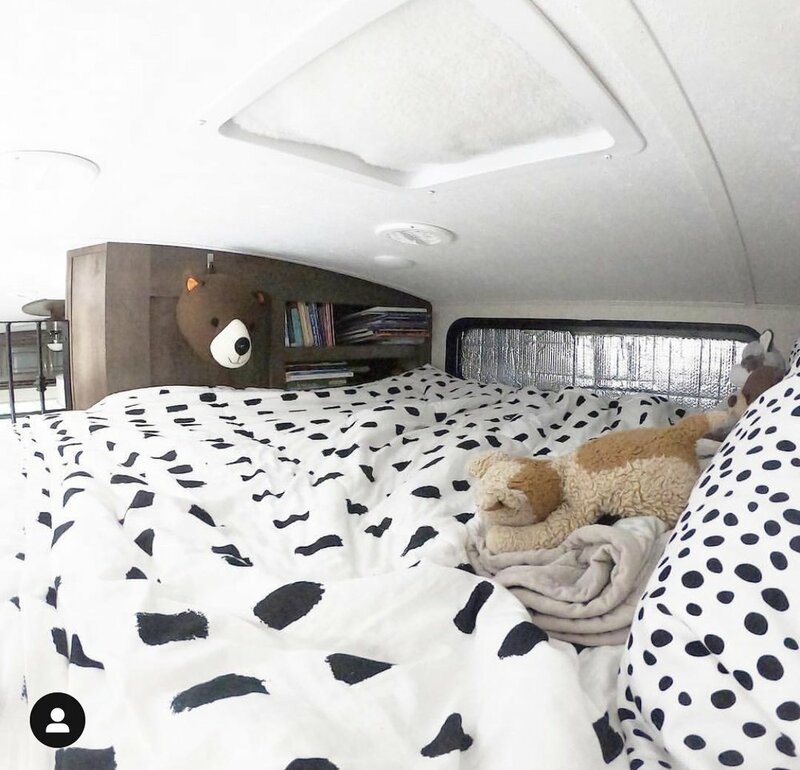 I’m excited to share my friend Kirsten from @fifthwheelliving - I love how they designed their RV and took a leap of faith to this chapter of their life. My name is Kirsten, and I am the person behind @fifth_wheel_living and this is my story. My husband is a very talented musician, and although he was very successful with pop music from Delaware, he wanted to break into country music. It was a random night In August 2017, a day without even talking about it to each other , we both got the feeling that we should move to Nashville. Devin immediately called me and asked what I thought, I told him YES, LETS DO IT! Right away we started planning, that planning shut our hopes down quickly when we saw how high the cost of living was! Apartments alone were around $1,300-$2,000 monthly for just RENT! So we started to look into buying a house, well I have never been to Nashville and my husband had only been a hand full of times. It just wasn’t a smart idea to buy right away and set ourselves up for debt. After that we kinda just said “oh well...”. I thought that’s what we did, but one night I was at work my husband Devin was doing some digging on the internet. He found a man living in a van and that led him to find 188sqft account. A couple who travels and lives in a fifth wheel! Devin asked me if we could do that and just be stationary in Nashville, obviously I was all for it. Fast forward to October 2017 we purchased our 2008 Keystone Montana. Luckily we had a friend who had all the tools and knew what he was doing. Devin was touring and I was working full time night shift. We worked night and day, anytime we could to get things done in our soon to be home. January 1, 2018 we were pulling away from our old home and on our way to Nashville! We did it! Fast forward to now, it’s been almost 1 year guys since we went tiny. We love Nashville, so much music, entertainment and fun! Being stationary has been a major plus, we get all of the pros of Nashville without all the cons! Cost of living is low for us, we are saving money, and my husband is living his dream. Going tiny has changed our life. It was suppose to be a 1 year thing until we found our forever home, but right now we aren’t planning on leaving this lifestyle anytime soon. When we are ready to buy a house, we will have our fifth wheel to sell and use as a down payment. How exciting is that?! We are a tiny living, debt free life style, planning for the future couple. I hope our story inspires you to follow your dreams, no matter how crazy it may seem. Going from 1600sqft to barley over 160sqft we have adjusted very well. One of our biggest concerns were our dogs adjusting. Bonnie, phoebe and Daisy. Yes we have three sisters. Many people asked if we would get rid of them, heck no. Our dogs are a small breed and they run around our tiny home like they own the place. Even though they don’t have a fenced in area to run around in, they still get their energy out in long walks and playing inside. They have adjusted very well, I honestly think they like it better, because we are all always close to them all the time. If you want to follow and learn more about our journey, these are our accounts. I’m so excited to share with you Kelly & Andy from @us3andtherv. I love following along their travels and i’m in LOVE with their latest business venture, @thepopupbnb! I think you’ll love it just as much as we do. I mean who wouldn’t want to stay in this cute tent & have top notch service?! So the idea to start a full-service, glamping tent rental really came to us the same way the idea to live full-time, on the road in an RV did, out of pure necessity. With the motorhome, we had hit a fork in the road as far as our careers and housing. At the time we were in a short-term rental that had run out and on the exact same day in which we were suppose to vacate the apartment or sign a new lease I found out I was being let go from my job. Also happening at this time was the passing of my grandfather, who was the original owner of our RV, who we affectionately call “Homie”. With no careers holding us back, no mortgage or lease keeping us stationary and the RV suddenly becoming available for purchase the signs all pointed to this solution. Moving into the motorhome just seemed like the most logical solution and since we had just been married (and had not booked a honeymoon yet) we decided this would be the perfect time to do it! So, without hesitation we sold our belongings and jumped into this full-time RV life head first. We had been living in the motorhome for just over 1 year when the idea to start a glamping business came to us. We had hosted a whole slew of friends and families coming to visit us on our travels and it didn’t take long to realize fitting extra bodies in a 33ft motorhome would be quite a struggle. Our Homie girl is spacious but her limits have definitely been tested with our large gatherings, so we wanted to figure out something that would act as an extension of the motorhome. Something that would solve our problem of not being able to comfortably host our visitors while also solving a completely separate problem of needing to generate income while traveling. To be honest our first thought was a mobile vintage trailer that we could possibly tow behind the RV, but that just seemed like a lot more work than we were wanting to put into this idea. It wasn’t until we were on a camping trip with some friends in Zion that we got our first glimpse of a CanvasCamp Bell Tent. Our friends had one and we watched them set it up with ease and instantly knew, this would be the best solution to meet all of our needs. Just like Homie, we purchased our 13.5 ft, all season, CanvasCamp Glamping tent to solve the issue of housing out of town friends and family but we also saw a potential income opportunity. Insert ‘The Pop-Up BnB’, a full-service luxury camping experience. Our love for camping in exotic places combined with the thrill of searching for those perfectly secluded sites really made us wish we had other people there to share it with. We have stayed in some magnificently, breathtaking locations and we wanted to share that same magical feeling with other people. Sometimes our guests have their own spots picked out that they would like their camp setup at and other times our guests solely rely on us to find them a spot that meets their needs. No matter where the location they can ensure a care free, over the top, luxurious stay. Our guests have hot meals delivered to their tent site, plush bedding, heaters and fans for temperature control and a plethora of add-on items to choose from, such as our “outdoor movie-night package”. We want our guests to show up and relax, never having to lift a finger. So we do everything in our power to make that happen and so far, the response has been overwhelmingly positive. Although this success has been wonderful and we feel extremely blessed, we still have a whole slew of hardships to tackle with this tent business. Growing pains at any new startup are common and we are no different. One of the biggest issues we have to continually tackle is the need for a large, open (and ideally flat) clearing to fit our tents 20 ft diameter. Nature is not always so friendly in providing us with a perfect area, so we work with what is there and are continually coming up with ways to improve this issue. Another battle to tackle in trying to run a glamorous camping experience in nature is dealing with the elements. We don’t always have the best weather, so if it means setting the tent up in pouring rain, we do it. We do our best to relay to our guests that this is a true camping experience and as such they could incur inclement weather in which they would be stuck inside the tent rather than exploring the area, like they had intended. So far, our wonderful guests have rolled with every element and made the best out of the situation. Which totally speaks to their rad personalities, but then again, if you book an overnight stay at a mobile tent in the middle of a secluded forest then you have to be pretty rad in the first place. We have hosted bachelorette parties, romantic getaways, kids’ birthday parties and single travelers just looking for a “once in a lifetime” experience. We hope to grow our business in 2019, though we are not entirely sure of what that looks like right now. I’m confident it will be unique and totally off beat, so stay tuned!